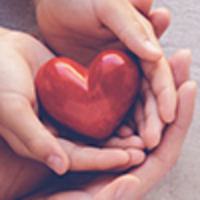 Provide comfort for the family of Donna Terepka with a meaningful gesture of sympathy. Scottsville - Donna Harris Terepka passed away peacefully on February 6, 2019 surrounded by her children and friends. Donna Jean Harris, daughter of Donald Jonathan Harris and Emma Mae (Collins) Harris, was born December 29, 1923 and raised in Highmore, South Dakota. She graduated from Oberlin Conservatory of Music in 1945 with a degree in Piano and Organ, and married A. Raymond Terepka in 1947. After teaching piano in the Preparatory Department at the Eastman School of Music, Donna began a long career giving private instruction. Donna and her family settled in Scottsville, New York in 1959, where she continued teaching private piano lessons in her Victorian home. 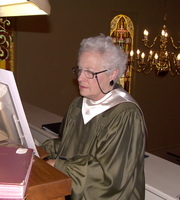 She became organist at Union Presbyterian Church, then Director of Music, positions she held for 36 years until her retirement in 2000. She established the Lenten Organ Recital series and the Music in Scottsville series, which brought musicians from Eastman School of Music and the surrounding area to perform in Scottsville. 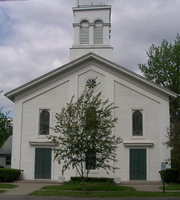 Donna also performed for many years as accompanist for the music program at Wheatland-Chili Central School, providing the soundtrack for many school musical productions as well as choral concerts.She served as Dean of the Rochester Chapter of the American Guild of Organists and on the board of the Scottsville Free Library. 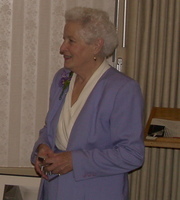 She is survived by her children, sons Raymond (Nancy Stewart) Terepka, John Terepka, Donald (Hendrina Schindeler) Terepka and daughters Nancy (James) Loftus, Evelyn (Donald) Schaeffer, and ten grandchildren. A Memorial Service will be held on April 13, 3:00 pm. at Union Presbyterian Church, 1 Browns Avenue, Scottsville with the Reverend Dane Gordon officiating. 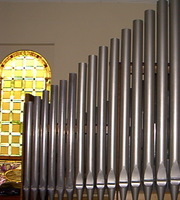 In lieu of flowers donations may be made in Donna’s name to the Schlicker Pipe Organ Maintenance Fund, Union Presbyterian Church, 1 Browns Ave, Scottsville, NY 14546 or to the Scottsville Free Library, 28 Main St, Scottsville, NY 14546. Donations are being accepted for: SCOTTSVILLE FREE LIBRARY. My deepest sympathy to the Terepka Family.